Looking for a super fresh, vibrant dinner that’s filled with flavor and crunch? 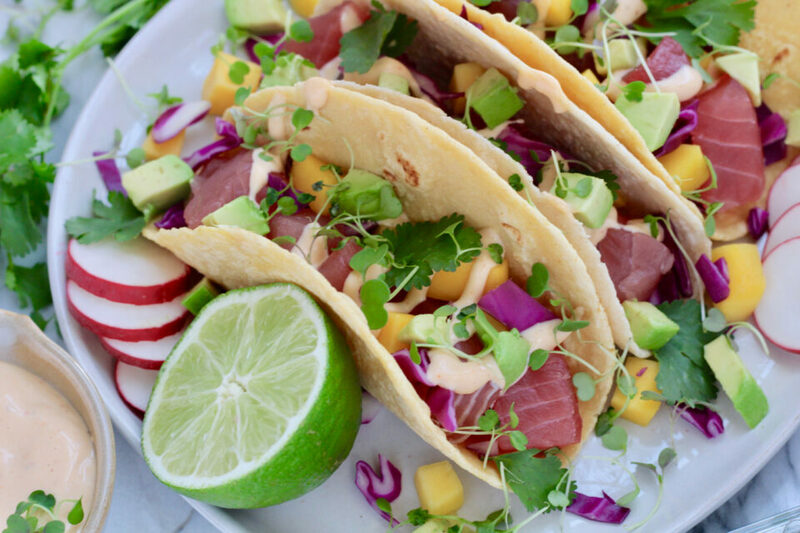 Revamp your Taco Tuesday by making these Ahi Tuna Tacos with Micro Spicy Shoots. They’re seriously the best tacos in the TUNA-verse! Loaded with color, these healthy tortilla-wrapped masterpieces are a total game changer. 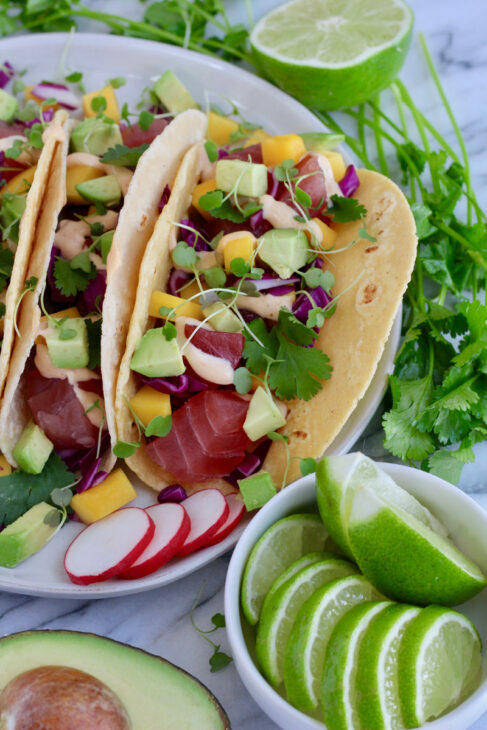 In addition to the gorgeous ahi tuna, the flavorful mix of avocado, mango, spicy chipotle mayo and crisp cabbage will convince your taste-buds that you’ve won the flavor lottery. Top it all off with fresh cilantro and micro spicy shoots and you’ve got yourself a glorious meal to remember. Are you practicing Whole30, Paleo, or want to stick to low-carb? No worries, friend, we’ve got you covered! Simply swap out the taco shell for a cabbage or romaine leaf. Boom, you’ve now got a compliant south-of-the-border feast. Chop and prepare all ingredients listed. Warm taco shells on the grill, if desired, and then assemble with fixings. Enjoy immediately with a hefty squeeze of lime juice. If you prefer to sear your tuna before consuming, do so while you chop the fruit and veggies. Not a tuna fan? Not a problem. Substitute with your favorite shredded chicken, ground beef or shrimp recipe. Want to add more crunch to this dish? Add some shredded carrots or slices of radish! You can also sprinkle the tacos with sesame seeds before serving. Yum, yum.